Stay visible and safe while performing outdoor activities. For camping, or at the park. 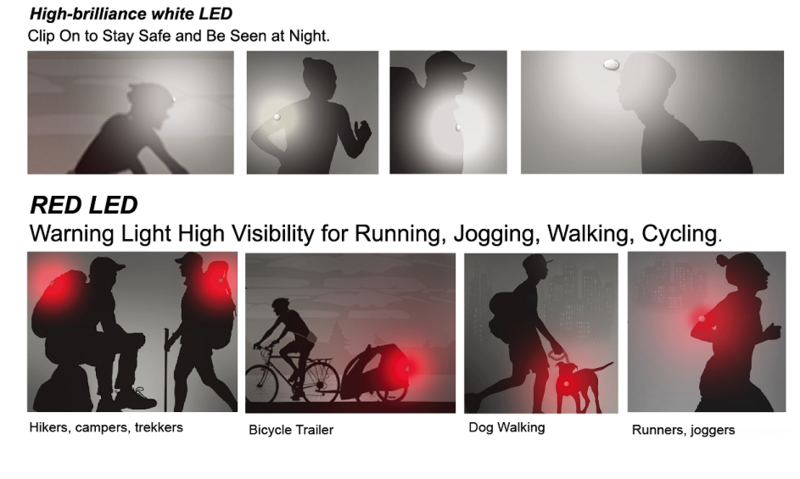 Safety lights are great for runners, joggers, hikers, campers, trekkers, cyclists, students, and anyone involved in activities such as running, hiking, camping, trekking, care repair, changing tires, boating, dog walking, etc. Compact, stylish and weighing just 14g, with 20 hours runtime, the Wearable Mini easily attaches to your helmet, pack or pocket, and with a host of different modes, will enhance your visibility. Little helpers, huge benefits The ability to be seen aids in safety and helps to avoid accidents. Safety lights with red / white LED are also handy to find your way, look for keys or gear in your pack. LOW PROFILE CLIP-ON WEARABLE SAFETY LIGHT. Clip On to Stay Safe and Be Seen at Night. After dark, just push the button to use a safety light and that will illuminate your walking path and alerting motorists. Warning Light High Visibility for Running, Jogging, Walking, Cycling;Protective Gear for Children, Adults and Pets, hiking poles, pavillions, baby buggies and much more.